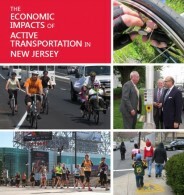 The primary objective of this study was to estimate the statewide economic impacts of active transportation in New Jersey in one year. The study was conducted in 2012 and used data from calendar year 2011. The research analyzed active transportation-related capital investments, businesses, and events to estimate economic activity generated and jobs supported. Using economic modeling, the research concluded that these components of active transportation contributed an estimated $497.46 million to the New Jersey economy in 2011.